It’s an important tone difference which I learned a while ago but didn’t actually personally encounter much until this past semester as a grad student, when suddenly the word “dabian” kept popping up everywhere. Just imagine (mis)hearing your professor tell the class: “I have to cancel class this Thursday because I have to take a dump.” The silly schoolboy in me inwardly giggled every time. I feel like I am in primary school again. Nice examples, but there’s still something especially funny about the possibility of confusing academia and pooping. BTW, what’s up with the 繁体? Have you converted?! i don’t how other chinese-speaking people think about it, but i don’t think the second word can be confused as the first one even if you mispronounce it. there are so many chinese words of similar or same pronounciations and native speakers usually understand a particular word from its context, so it’s not likely that a native speaker misunderstands the meaning of that word as another one of similar pronounciation. in a recent talk show on CCTV, the eidtor-in-chief of Encyclopidia Britanica said that chinese pictographic language is the major obstacle for foreigners to learn mandarin, and some foreigners i know can only read and write PinYin, so why it’s difficult to develop a alphabetic system of chinese for daily use? I can’t help but snicker when I hear Taiwanese people say 炸雞. Normally, the 炸 is second tone for “fry” and fouth tone for “explode”. 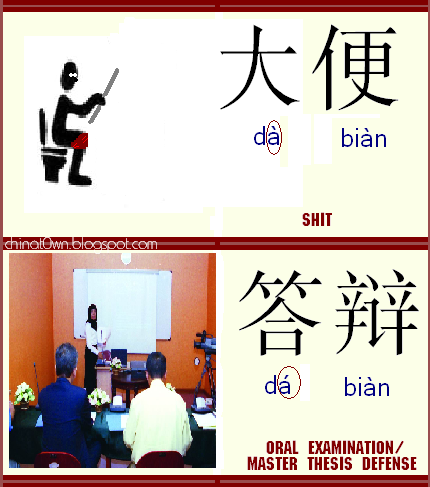 That would mean that 炸雞 zhá jī, and 炸彈 is zhà dàn. That’s what all the dictionaries and Chinese textbooks for foreigners here say… BUT most younger Taiwanese people always pronounce 炸雞 as zhà jī. No matter how many times I hear it, I can’t help but picture an exploding chicken. Personally I feel 繁體字 are more elegant than 簡體字. It seems 簡體字 is often only used within Mainland China. Er. Fry is “zha2”?!? Is this some wacky northern pronounciation? I (and every other Mndarin speaker I know) have always pronounced it “zha4” (actually, “za4” by the southerners). Not to start a religious war, but I was under the impression that simplified characters are used in Singapore and by many Chinese abroad, and taught to the majority of Chinese language learners across the globe. I have a friend (lao wai) like bingfeng’s friends, she’s asked me whether there is an application (web page or desktop) that can translate Chinese character text into just pin yin. I said I only knew about Kingsoft’s 金山词霸. Has anyone seen anything like I’m describing? Hmm… maybe it’s some weird “older Taiwanese 外省人” thing, Richard. I’m in Taiwan. All the dictionaries and text books here say fry is zhá and most even list 炸雞 zhá jī as an example. That’s how all my teachers in 台北 talked, too. But after I moved to 龜山 (also in Taiwan), I’ve only heard zhà jī. Hmm… I just checked that red Oxford concise dictionary and it says zhá. Maybe that was the old way, and the pronunciation’s changed? Aesthetic preferences aside, I figured that since you grew up in the mainland, you would stick to what you were used to. So I’m wrong in either: (1) that you grew up in the mainland, or (2) that familiarity with a character set fosters loyalty to it. I did grew up in Mainland China and was taught with Simplifed Chinese. Personally I feel some of the simplified characters have lost their true essense. I was talking to a friend last night about Chinese language. He said he was told in his Chinese history class, the reason Mainland China adopted the Simplified Chinese was to increase the literacy rate. I have also heard from conspiracy theorists that the real reason for Mainland government to push for Simplified China was to create an intentional gap between mainland and Taiwan. Chinochano, have you ever been to 普陀山 (putuo mountain)? speaking of mountains, does anyone know why Brokeback Mountain was translated as 断臂山 and not 断背山?